At last, a DC superhero lightens up in this retro lark. Jack Dylan Grazer and Zachary Levi test out the latter’s lightning hands in Shazam! Warner Bros. They finally got it. After years of tepid reviews from critics and grumbling from fans, the decision-makers at DC Comics and Warner Bros. finally understood that trying to out-grim Christopher Nolan wasn’t working for their superhero movies. If you’re messing around with people in colorful costumes who have fantastic powers, you might as well have a little fun. So the delightful Shazam! comes to us, and it’s the first of the DC movies that I would happily watch again. If the studio had to steal several pages from Marvel’s playbook to accomplish that, you won’t hear any complaining from me. The story picks up in Philadelphia, where 14-year-old Billy Batson (Asher Angel) is stopped by police, having run away from more than 20 foster homes around the country while searching for the mother who lost him at a carnival when he was little. He’s placed in yet another group home, and when he stands up to some schoolkids who are bullying his new paraplegic foster brother Freddy (Jack Dylan Grazer), he’s whisked away to a magical place where an old wizard (Djimon Hounsou) pronounces him pure of heart and gives him his superpowers. 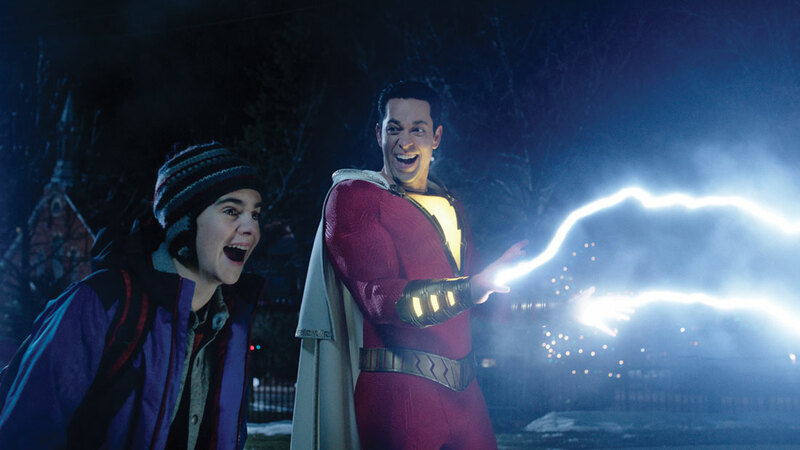 When Billy says the name “Shazam,” he transforms into the costumed hero by that name (Zachary Levi) with an adult body and superhuman strength, speed, and bulletproof skin. Fortuitously, Freddy happens to be a comic-book nerd who can help him sort out his new existence. Unlike all the previous DC superhero movies, this one is actually funny. Upon gaining his superpowers, Shazam does the opposite of keeping a low profile, posting YouTube videos of his feats and posing for selfies with fans while shooting lightning bolts from his hands. Later on, Shazam and Freddy drop into a real estate office to ask about buying a superhero lair. First-time screenwriter Henry Gayden infuses his script with wisecracking pop-culture gags (like the on-point reference to Penny Marshall’s Big) and a becoming self-awareness — Billy is rightly wary when the wizard asks him to place his hands on his staff. I like how the other foster kids in the home (Grace Fulton, Ian Chen, Faithe Herman, and Jovan Armand) all have their own distinct and distinctively funny personalities. 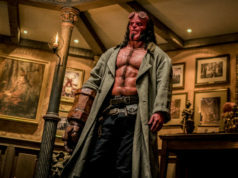 The star of TV’s Chuck, Levi is more than capable as a tween wowed at his own powers, though Marvel has already given us a hefty supply of white-guy doofuses who happen to be totally ripped. The real standout here is Grazer (whom you saw in It), bringing unholy energy to his role and acting as a garrulous foil to both Shazam and Billy. 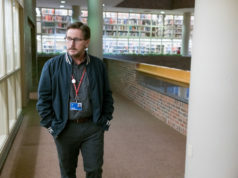 If you wanted to be ungenerous, you could note the movie’s issues with pacing, or the relative dullness of the supervillain (Mark Strong), or how the film doesn’t quite hit on its emotional beats — you know that when Billy finally finds his mother, she won’t be worth the trouble of finding. Even so, Swedish director David F. Sandberg fares quite well in this setting, especially when you consider that his résumé to date has been all horror films (Lights Out, Annabelle: Creation). Look at the way he stages the gag with Shazam in a public bathroom trying to figure out how to take off his costume, or the climactic showdown where the villain’s menacing monologue is undermined. Sandberg succeeds here simply by dint of not screwing up the jokes. Maybe the best thing here is the lightness of tone here, reminiscent of some of Marvel’s enjoyably dizzy entries like Thor: Ragnarok and Ant-Man and the Wasp. The DC movies tried to insert some comic touches into Wonder Woman and Aquaman, but they didn’t have the material or the talent for it. Here they have both, couched in a refreshing gee-whiz attitude that wouldn’t have felt out of place in a 1980s movie. Being retro is not always a good thing, but in Shazam!, it amounts to a breath of fresh, lightning-singed air. Starring Zachary Levi and Mark Strong. Directed by David F. Sandberg. Written by Henry Gayden. Rated PG-13.